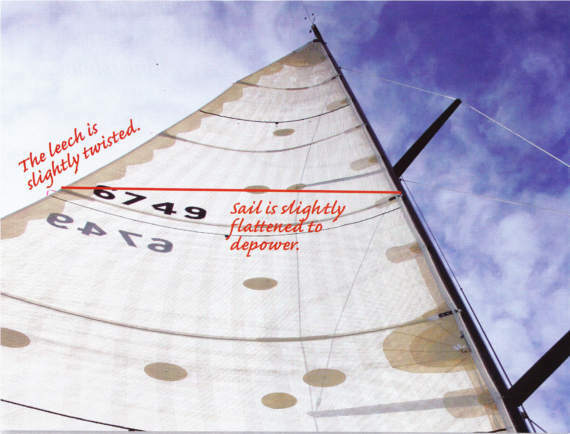 A lot of racing boats, are using specifically designed reaching sails such as jib tops (full cut, high-clewed genoa) and Code 0 (flat cut, minimum to mid-girth asymmetric spinnaker) sails for tighter reaching legs. These sails are used before the wind angle moves aft enough to permit spinnakers to be flown, i.e. 40 to 80 degrees off the wind. They are proving very successful in their designed conditions and are powered up by moving the sheeting angle forward and depowered by moving the sheeting angle well aft. Boats that don’t have the budget for these specialist reaching sails must rely on their existing headsails for the reaching legs. The true wind angle we are covering in this section is 38 to 95 degrees True wind Angle. It is important to trim the sails to be as powerful as possible; this is done by easing the backstay and outhaul right off and relaxing luff tension. The sails should be trimmed on the sheet so that the telltales all the way up the sail are flowing horizontally. Moving the genoa sheeting position outboard is beneficial as this opens the slot between the mainsail and genoa. The person on the helm should be tending to sail the boat up in the lighter wind patches to keep the boat speed up and away in the gusts to make the boat accelerate, the sail trimmers should be adjusting the sails in and out to suit. When the wind increases to the medium range it is important to trim the sails to eliminate excessive weather helm on the rudder and to ensure the boat isn’t heeling over too much, as these two factors will slow the boat. To minimise weather helm the mainsail should be flattened out by bringing on the backstay and outhaul. The leach should be twisted off easing the mainsheet. These adjustments will also help minimise excessive heeling. I would also recommend moving the genoa car aft and outboard to flatten the foot and open the upper leech area which depowers the genoa. In the heavy reaching conditions it is important to set the boat up so that it is not over- pressed and rounding up. If the mainsail is back-winding excessively move the genoa cars well aft to allow the genoa leech to twist open this will mean the upper luff tell tales will be lifting quite aggressively, but the lower luff telltales will still be flowing correctly and pull on the backstay and outhaul to maximum tension which will blade out the mainsail, this will also help tighten the forestay which will flatten and depower the genoa. It is important to keep control of the boat, so reduce sail where needed and the boat will sail much faster with less drag. In medium to fresh conditions jib staysails can increase your boat’s performance considerably. The staysail sets up inside the jib and creates another slot, which powers the boat up. It is important not to over sheet the staysail. We always set it up with the upper tell tales just lifting, which requires your cars to be up further aft. Over-sheeting the staysail will stall the main and create excessive back-winding. If your boat doesn’t have an inner forestay to hank the staysail to, then the luff can be fitted with a vectran luff rope which acts like a forestay. Your halyard should be tensioned to minimise excessive sag. The backstay and outhaul have been pulled on to flatten the sail and depower it to reduce excessive heeling and weather-helm. The mast is pulled back and the leech is slightly twisted.